Those passing by Fred Meyer on Highway 303 might not notice that a $10.2 million overhaul is wrapping up. The store’s exterior hides a transformation on the inside that includes new departments and products, has made the 204,000 square-foot location much greener and gives the grocer a contemporary look. Sushi now has its place in the East Bremerton store. Since March, construction crews have been gutting the store section by section. Aside from some finishing touches to the jewelry department and children’s play area, the work is done. 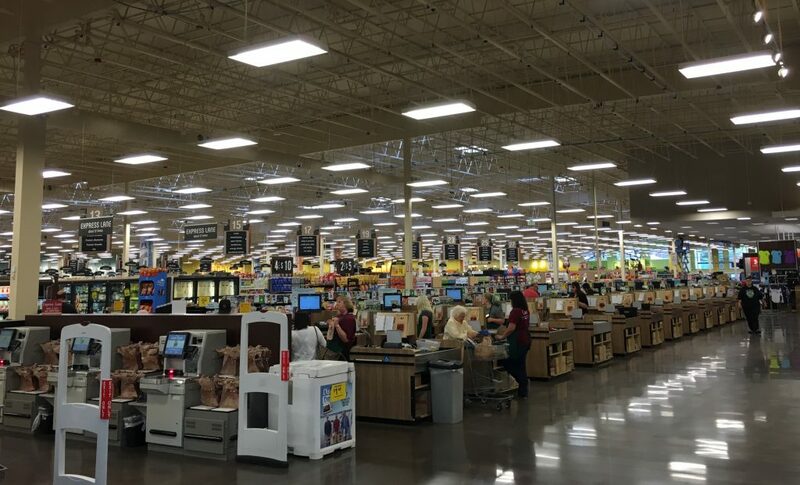 Kroger, which owns the store, wanted a renovation that revolved around the customer experience, and store manager Axel Strakeljahn is confident they succeeded. One need only look up or down upon entering to find the most obvious changes. The store now has 63 skylights and new lighting, to go with brighter color schemes. On the ground, all the original tiles were stripped off, exposing a concrete floor. It was ground down, sealed and polished, giving the floor a darker, more contemporary look. The goal was sustainability, Strakeljahn said. Natural light will lower the building’s carbon footprint and its new floor needs none of the chemicals — just water — that the old one required. A new Starbucks cafe now greets visitors near the store’s northern entrance, replacing what was a (Starbucks-owned) Seattle’s Best Coffee location. Also near the northern entrance is a floral department and, for the first time, the store has hired a full-time florist. The wine section doubled in size, and is now more than 100 feet longer than it was before (And the store already has a full-time wine steward). For local beer connoisseurs, there’s also more room for microbrews, too. New product lines have been introduced, to include Seattle’s Top Pot doughnuts (which are delivered daily), Boar’s Head Premium Deli meats and cheeses and a create-your-own pizza section in the deli. For the first time, there’s a dedicated section for Washington sports teams. A new, larger pharmacy replaces the electronics department, which moved east to the back of the store and is also larger. 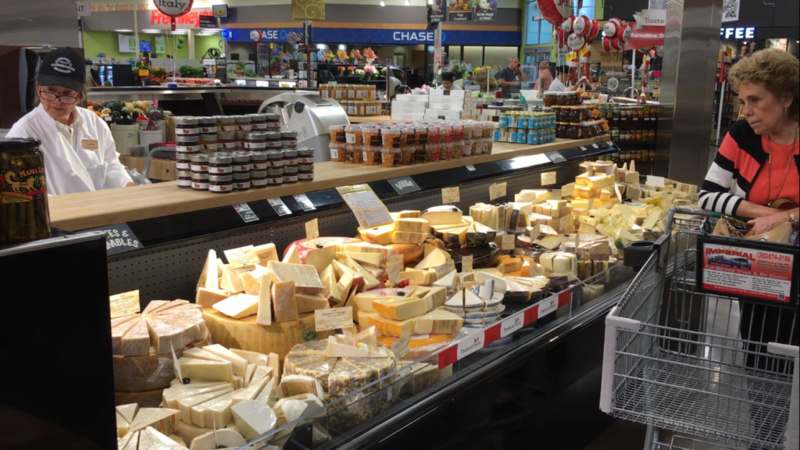 The nutritional food section, which includes organics and bulk foods, is also about twice the size it used to be. The store is celebrating its “Grand Re-opening” starting at 7 a.m. Friday. Doughnuts and coffee will be served, specials will run through the end of the month and the first 2,000 customers will get Fred Meyer reusable grocery bags. Check back to the Bremerton Beat Tuesday for a video of the remodeled store and an interview with Strakeljahn. 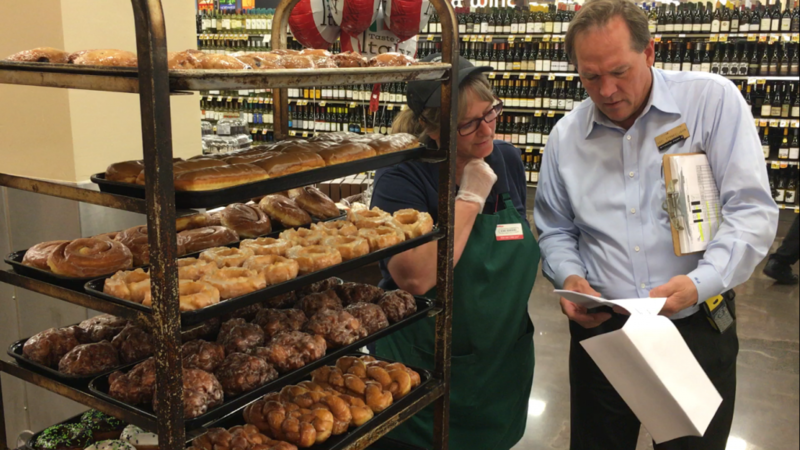 Strakeljahn (right) at the store Monday, as more Top Pot doughnuts are loaded onto the shelves. 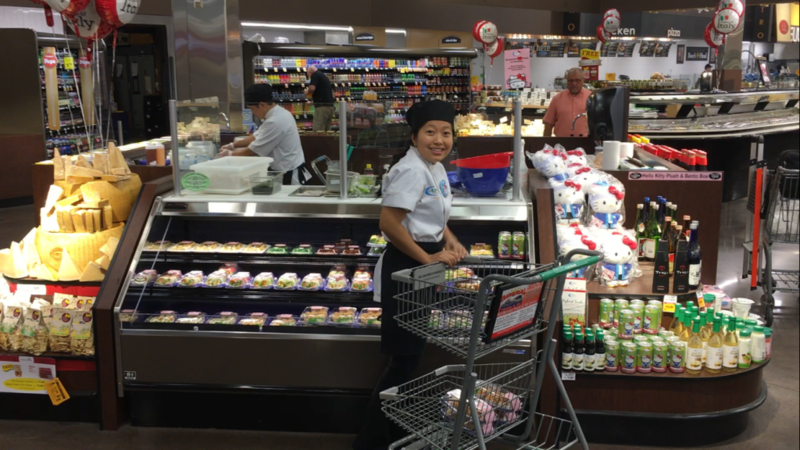 EBC – West Sound loves Fred Meyer in East Bremerton!